Description	 MS in Mesokemic (Middle Egyptian or Oxyrhynchite dialect) on papyrus, Oxyrhynchus region, Egypt, 1st half of 4th c., 39 ff. (- ca. 6 ff. ), 23x20 cm, single column, (18x14-16 cm), 25-28 lines in a fine regular Coptic uncial. MSS 2648, 2649, 2651 and 14 ff. of Isaiah (in Mesokemic, ca. 300) were found tipped in among the leaves of the present codex, which originally had ca. 45 ff. Probably from the same hoard as the Chester Beatty papyri, now in Dublin: Chester Beatty Library. Provenance	 1. Monastery in the Oxyrhynchus region, Egypt (4th c. - ca. 1930); 2. Antiquity dealer, Alexandria (ca. 1930); 3. Private collector, Zürich. Commentary	 The text opens at ch. 5:38 and goes more or less continuously to the end .The present codex is the earliest Matthew in any Coptic dialect. The 11 chapters, 6-9, 13-17, 22 and 28, and a great number of verses elsewhere, are in addition the earliest witnesses to these parts of the Bible. The text is unique, not following any Coptic nor Greek manuscripts known of Matthew. The earliest Matthew version of the Lord's Prayer are to be found in lines 13-19. Prof. Dr. Hans-Martin Schenke in his editio princeps of the text, has named the manuscript Codex Schøyen, with the siglum Mae 2. 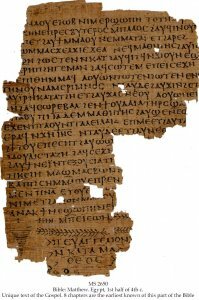 (siglum Mae 1 being the Scheide Codex of 5th c.) His conclusions are that the text is not representing a free text transmission in relation to all the other extant Greek and Coptic manuscripts of Matthew, but that it is a correct translation of an entirely different Gospel of Matthew. There is only one other Gospel of Matthew known, the lost Hebrew Gospel of the Jewish Christians mentioned by the church fathers. This would have been the Hebrew exemplar of the Greek translation the present manuscript is based upon. Actually the famous statement by Papias that the Hebrew Gospel of Matthew was translated into Greek several times (Eusebius, hist. eccl. III, 39, 16), now come in a new light. Due to a series of textual differences between Codex Schøyen and the Canonical Gospel, it appears that both Gospels derive from different versions of the Hebrew Matthew. The consequence is that the relationship among the Synoptic Gospels has to be entirely re-evaluated, causing far-reaching and dramatic consequences for New Testament research. 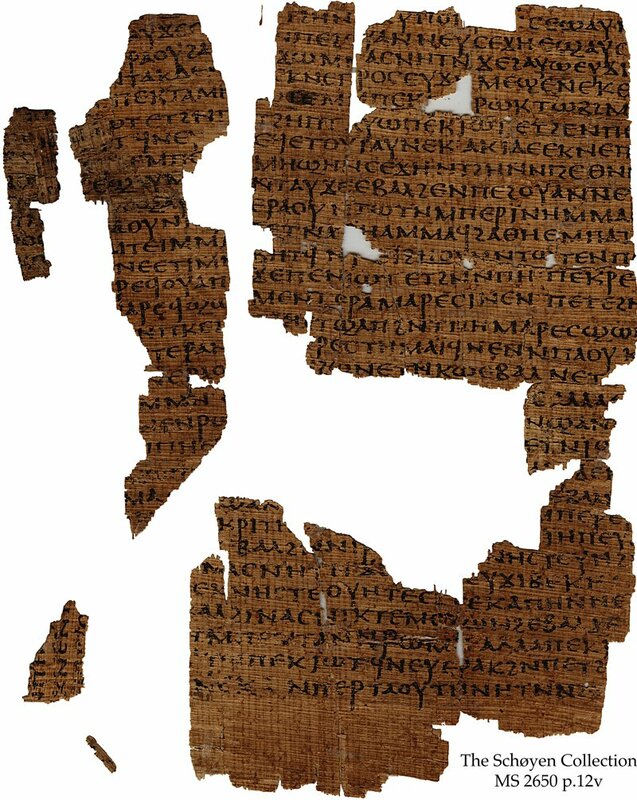 Published	 Hans-Martin Schenke: Das Matthäus-Evangelium in einer Variante des mittelägyptischen Koptish auf Papyrus (Codex Schøyen); in: Enchoria, Zeitschrift für Demotistik und Koptologie, Band 26, 2000, pp. 88-107, Tafel 12. Hans-Martin Schenke: Coptic Papyri, vol. I. Manuscripts in The Schøyen Collection series vol. 2, Jens Braarvig, Editor-in-chief. Oslo 2001. Wieland Willker: A textual Commentary on the Greek Gospels. Some notes on the Coptic Mt. Schøyen MS 2650 = mae-2. Internet article, based on Schenke's book. L'Évangile selon Matthieu d'apres le papyrus copte de la Collection Schøyen, analyse litteraire, by M.-É. Boismard, O.P., in Cahiers de la revue Biblique. Paris, J. Gabalda et Cie Editeurs, 2003. (Manuscripts in The Schøyen Collection series vol. 10.) Tgitze Baarda: Mt. 17:1-9 in “Codex Schøyen”: in: Novum Testamentum 46(2004), pp. 265-287. Mentioned	 Sergio Cingolani: Dizionario di critica testuale Nuovo Testamento. Milano, Edizioni Sao Paulo, 2008, p. 220.